I've been playing with the Kambrook Family Banquet Frypan to made bolognese, and it was a hit. 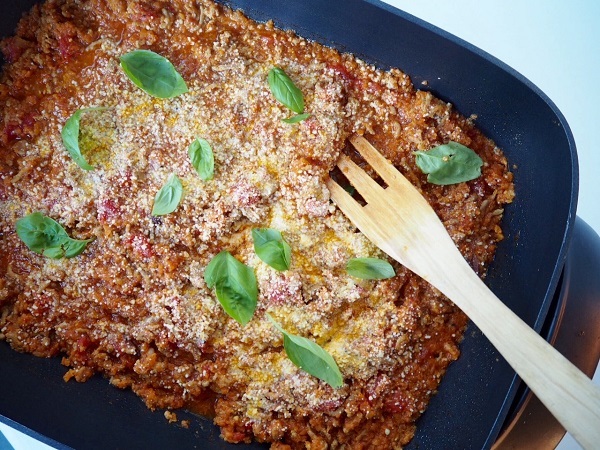 This was your normal beef bolognese using a leaner turkey meat packed with sweet potato that not only bulked it up, but added a bunch of goodness. The Kambrook frypan made it easy as there was no need to worry about the food sticking to the bottom or over cooking as the heat is moderated by the frypan. The clean up was amazing easy, it just washed up without any need for elbow grease. Set the Kambrook Family Banquet Frypan to 10, add a splash of olive oil followed by the grated sweet potato, onion and the minced garlic. Cook stirring occasionally for 5 minutes, until the vegetables soften. Add the turkey mince and break up, stir through and cook for 5 minutes until lightly browned. Add the tomatoes, stock and salt and pepper; stir through and bring to the boil then reduce the heat to 2. Place the lid on and allow to simmer for 1 hour. Remove the lid and sprinkle the parmasen cheese and basil over the top. Enjoy with cooked pasta or make into enchiladas, serve over corn chips or a baked potato. Store leftovers in the fridge in an airtight container for up to 3 days. Alternatively, place into a freezer safe container and freeze for up to 3 months.